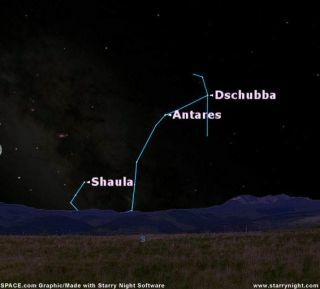 Shaula, also known as Lambda Scorpii, is the second-brightest star in the southern constellation Scorpius (which is visible in much of the Northern Hemisphere). Like many of the bright stars close to Earth, Shaula is actually more than one star. Astronomers have confirmed it is made up of two stars, and there could be a third one given that the star system is producing more X-rays than expected, according to astronomer David Darling. Shaula is also a Beta Cephei variable star; its changes in luminosity are due to "subsurface ionizing metals that act as a heat valve," wrote Jim Kaler, a University of Illinois astronomy professor emeritus. The star was noted in the catalog of Johann Bayer, but despite its brightness, it was assigned the 11th letter of the Greek alphabet — Lambda — rather than the usual Alpha for the brighter stars. Kaler supposes that it probably was because the star is so far south in the constellation. In Scorpius, Shaula is outshone only by Antares from the vantage point of Earth; the star is tied for 24th brightest in the sky along with Gacrux (Gamma Crucis). The star may also be changing quickly: "Shaula has either stopped hydrogen fusion in its core or is close to doing so," Darling wrote. "With a mass of around 11 solar masses, it may eventually explode or more likely turn into a heavy white dwarf, possibly one with a neon-oxygen core." A subgiant B star refers to a type of B star — hot stars that have hydrogen and neutral helium dominating their spectrum, according to astronomer Perry Berlind. "There are a wide variety of sub-types, as B stars occur over a wide range of luminosity, many have companion stars, and many have circumstellar material," he wrote. At hundreds of light-years away, Shaula has been a problem for astronomers trying to learn about it, Kaler wrote. "The distance has been a problem. While the Hipparcos satellite gave 700 light-years, more recent observations give only half that (365 light-years)," he said. Currently, astronomers believe Shaula is made up of two stars. The principle one, Shaula A, is a class B star, with Shaula B orbiting about six astronomical units or Earth-sun distances away. Shaula B is believed to be about 5,000 times more luminous than the sun with a temperature of 21,000 K (about 37,340 F or 20,725 C). Astronomers are still trying to figure out if there is a third star in the system. If it does exist, Shaula Ab (as the theoretical star is called) is just under two times the size of our own sun. It is expected to orbit Shaula at an average distance of just 0.15 AU, which would be well inside Mercury's orbit if the star were transported to our own solar system. "Shaula Ab might be a neutron star created in a supernova blast from a much more massive progenitor, a massive white dwarf that is the result of mass transfer, or — which seems to be the most likely — a star that is still in the act of forming, a 'T Tauri' star," Kaler wrote. If Shaula A does explode as a supernova, as most astronomers expect, then it would likely destroy the much smaller Shaula Ab when it does so, Kaler added.